Hello, I am a Truckee resident and full time employee of the Tahoe National Forest. I am also a tutor for the Life Sciences, Environmental Sciences, and Math through the high school level. Being a tutor is a great opportunity to hone my own skills as an educator as well as pass on valuable knowledge to current students. I received a BS in Environmental Science from UCLA in 2015. I have completed rigorous courses in calculus for life science students through the undergraduate level. I was part of a team that conducted conservation biology research, working closely with professionals in the field and carrying out an actual reintroduction of western pond turtles. In my senior year, I was the Education Coordinator for Global Environmental Brigades. This involved educating a team of students in sustainable agriculture and ecology before their service work in Panamá. I have experience working with and educating children. I was a part of UCLA’s UniCamp and Mentorship. These organizations offer educational and recreational experiences to inner city, at-risk youth. In high school, I earned my Eagle Scout award, which required me to educate and lead younger scouts in community service, time management, and teamwork. I believe my knowledge in the field of life sciences and my experience working with and mentoring children makes me an ideal candidate as a tutor. I am available to hold tutoring sessions at the home of the student, local libraries, or local businesses such as coffee shops. I look forward to hearing from you and helping you achieve success in your studies! During undergrad I completed a calculus series that was designed for life science majors. Many of the math courses I took in college relied on the mathematic fundamentals covered in both middle and high school. During my undergraduate career I completed a calculus series that was designed for life science majors. These math courses relied on the mathematic fundamentals covered in Algebra 2. I understand that Algebra 2 can pose challenges to many students, and I would be happy to help you achieve academic success in this subject. As an Environmental Science Major, many of the lower division courses I was required to complete focused on the biological sciences. I understand that this subject requires not only logical thinking and memory, but also important study and time management skills. From my own experience, I know how demanding this subject can be and I think I can use my knowledge of the subject as well as study strategies to help your child. Geometry was one of my favorite math classes to take in high school. This is an important subject to me because of its incorporation of mathematical proofs. Understanding the logic behind mathematical computations is critical, and I would be glad to help students gain this understanding. As a Conservation Biology minor, ecology is my passion. 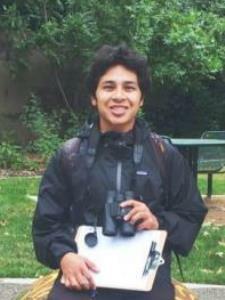 Aside from completing many courses in the field of ecology, I also have field experience working as an ecologist. The focus of my undergraduate senior project was to conduct a reintroduction of Western pond turtles to Southern California using genetic data, GIS information, and land surveys. My research team and I also conducted a small scale reintroduction at UCLA's Botanical Garden. I would be very happy to help students with their ecology course. He is currently teaching my brother geometry. He knows how to teach a problem easily so that my brother can understand. Joseph is very patient and kind, which helps my brother to feel comfortable.